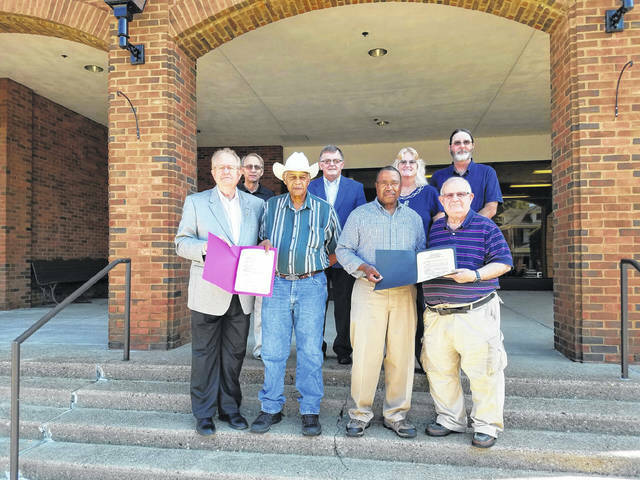 Gallia County and Gallipolis City Commissioners presented proclamations to the Gallia County Emancipation Celebration Board proclaiming the weekend of Saturday, Sept. 22, and Sunday, Sept. 23, as the 2018 155th Emancipation Celebration Weekend in Gallia County and Gallipolis. The Celebration will be held at the Gallia County Junior Fairgrounds. From left to right are Gallia County Commissioner Harold Montgomery, Emancipation Vice-Pres. Glenn Miller, Emancipation President Andy Gilmore, Gallipolis City Commissioner Tony Gallagher. Second Row from left to right are Gallia County Commission President David Smith, Gallia County Commission Vice-Pres. Brent Saunders, Gallia County Administrator & Emancipation Treasurer Karen Sprague, Emancipation Board member John Grubb. Jim’s Farm Equipment makes donation for 2018 Gallia County Emancipation Celebration. 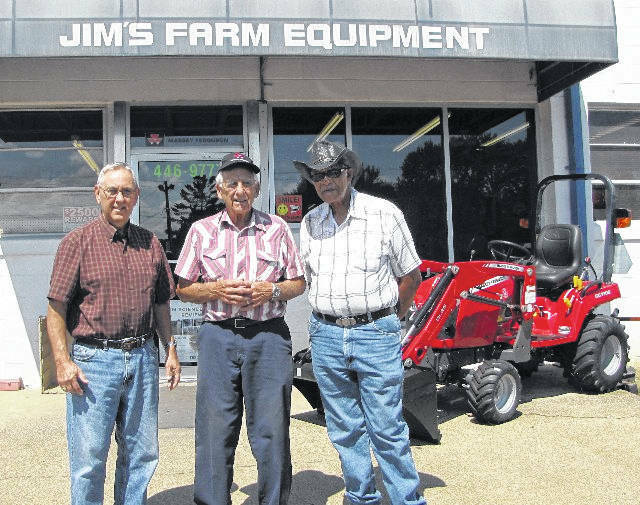 Pictured left to right are Emancipation Committee member Jim Oiler, Jim’s Farm Equipment Owner Jim Fraley & Emancipation Vice President Glenn Miller. Medical Mutual of Ohio makes $1,000 donation for 2018 Gallia County Emancipation Celebration. 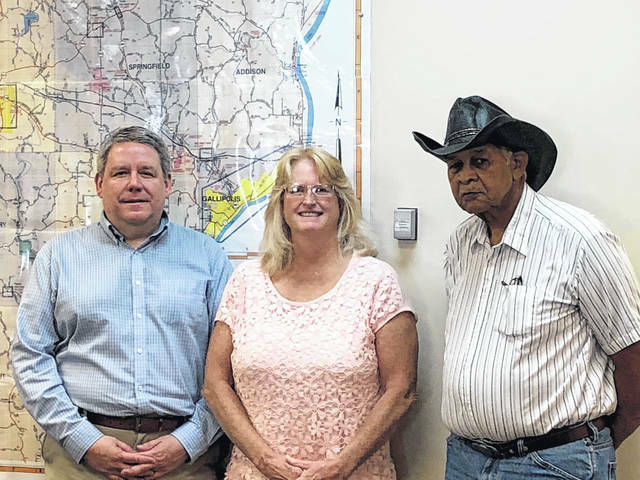 Pictured left to right are Medical Mutual of Oho Representative Jeff Fleming, Emancipation Treasurer Karen Sprague and Emancipation Vice President Glenn Miller. 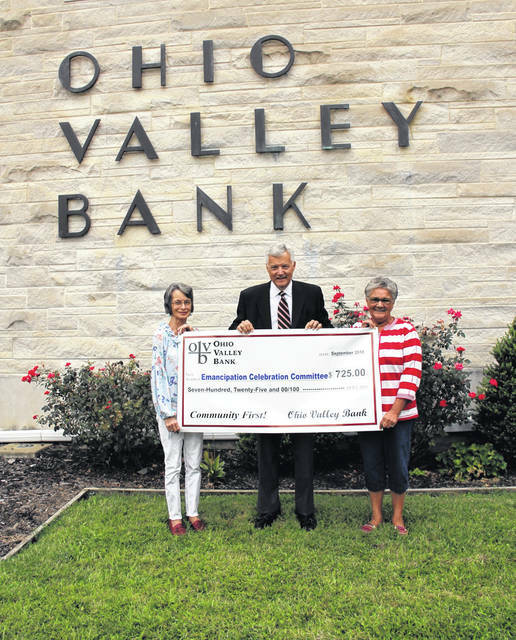 Ohio Valley Bank makes donation for 2018 Gallia County Emancipation Celebration to sponsor the Newport Aquarium Wave on Wheels Shark Cart Program. Pictured left to right are Emancipation Committee member Brenda Jackson, Ohio Valley Bank Representative Jeff Smith and Emancipation Committee member Beverly Jackson. Among attractions and entertainment to be featured at at the celebration includes the Shark Cart exhibit. The exhibit was formed in 2015 and brings live sharks to visitors as the Wave Foundation at the Newport Aquarium travels and displays its animal ambassadors. This program demystifies common misconceptions about sharks and gets visitors up-close and personal with with these creatures. In addition to the live sharks, several animal artifacts are used in this presentation like shark jaws, a can of shark fin soup, shark eggs and more. Participants have the opportunity to touch animal ambassadors. Some animals included may be considered endangered and require supervision or additional equipment while interacting with visitors. Lawrence Greene will bring drums and percussion to the Emancipation Celebration for an educational drum and dance circle. Using drums from around the world, shakers and body percussions, he and visitors will make music. He has 25 years of experience with children. Greene plays West African drums for classes at Factory Street Studio in Athens, where he has a fiscal sponsorship, and for Ugata a Pan African group, focused on education entertainment and the environment. This is a class for covering African History, the Islamic golden Age in Africa and the cultural roots of Africa before the slave trade. Beginning 1999, Gerald Payn began as an Abraham Lincoln presenter, having around 75 engagements a year recently, and has visited every place Lincoln lived during his lifetime plus a number of Civil War Battle sites and other related places. Payn was inspired to present Lincoln by Jim Getty, of Gettysburg, Penn. He is a life member of National Association of Lincoln Presenters and is a “full height” Lincoln presenter at 6’4”. He performs in costume and presents in first person. He speaks on a large variety of topics such as the life of Lincoln, Lincoln’s last days, highlights of the Civil War, Lincoln and his interactions with religion, law, politics, leadership and more. Payn attempts to emphasize the human side of Lincoln. Payn’s wife, Marilyn Payn, often accompanies him in period dress and can present Mary Todd Lincoln. Michael Crutcher is a devout scholar of Frederick Douglass and believes his calling is to share Douglass’ principle of freedom, equality, religion and self-esteem. He will present as Frederick Douglass during the celebration. A retiree from the United States Army, and former assistant professor at University of Kentucky’s Lexington Community College, Crutcher began his acting career with Images Modeling and Acting Agency in Lexington, Kentucky. Since then, he has been in several television commercials and training videos. He was a stand-in actor in the movie Seabiscuit and can be seen in the movie Dreamer, with actors Dakota Fanning and Kurt Russell. Crutcher’s current role was inspired after research revealed his great-great grandfather, Daniel Gilchrist, was a member of the 13th United States Colored Troops Heavy Artillery out of Camp Nelson, Kentucky. He also discovered that Daniel’s father was from Virginia, where Douglass’ lineage was traced to before his family moved to Maryland where Daniel’s mother was from. Steve Ball is a musician and historian from Columbus. Steve started both playing the guitar and studying the American Civil War at the age of 12. Over the years, Steve developed an interest in older styles of American music, and has performed in Folk groups, Bluegrass and Country bands, Square dance bands, and even a Western trio. His interest in Civil War music was generated by tunes he learned while in the western trio, and eventually he built a repertoire of songs from the 19th century, both before and during the Civil War period of 1861 to 1865. His interest in the history of the war led to learning about the composers, and the events that led to many of the songs of the period being written and composed. As his knowledge grew, he developed a presentation that explains both why the tunes were written, and what was going on in the war at the time. The songs are presented in a somewhat chronological order, and Steve tells the story of each song, and keeps listeners informed of the progress of the war at the same time. Re-enactors will play the part of the Fifth Regiment of the U.S. Colored Troops during the celebration The regiment was formed as the 127th Ohio Volunteer Infantry at Camp Delaware, Ohio. It was re-designated the Fifth Regiment, United States Colored Troops, and moved to Norfolk, Virginia, in November 1863, immediately after three months of organization. It served at Norfolk and Portsmouth in the Department of Virginia and North Carolina until January 1864, during which time the unit participated in Brigadier General Edward A. Wild’s expedition to South Mills and Camden Court House, North Carolina, from December 5 to December 24 and in action at Sandy Swamp, North Carolina, on December 8. The Fifth was then moved to Yorktown, Virginia where it became part of the XVIII Corps and was involved in several expeditions: Wistar’s Expedition against Richmond from February 6 to February 8, 1864, an expedition to New Kent Court House in aid of Brigadier General Hugh Judson Kilpatrick’s cavalry from March 1 to March 4 (including action at New Kent Court House on March 2), an expedition into King and Queen County from March 9 to March 12, and an expedition into Mathews and Middlesex Counties from March 17 to March 21. The Fifth participated in the capture of City Point, Virginia, on May 4, 1864 and while in the city the regiment served fatigue duty, built Fort Converse on the Appomattox River, defended an attack against Fort Converse on May 20, and took part in Brigadier General Benjamin F. Butler’s operations on the south side of the James River and against Petersburg and Richmond.